I have been on vacation, in a land without Internet or cellphone service, known as the NorCal coast. As such I have only just now gotten a chance to hop on the SWTOR PTR and check out all the changes that await us. But first and foremost, I have to tell you about the above screenshot. That isn’t a hack — that is me getting to dance with Khem Val!! 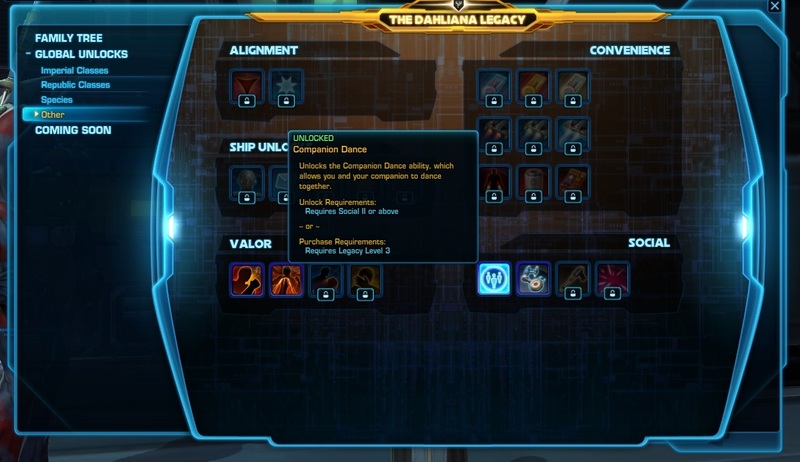 That’s right, you too can unlock the companion dance ability (which you will find in your abilities window, under the legacy tab, so you can pull it out to your action bars to use it.) This totally awesome ability is available for the low low cost of only attaining social level II, or purchasable with Legacy level 3. I didn’t realize just how much fun I would have with this one. But dancing with Khemmy totally made my day. There are a number of other equally awesome and amazing changes now available to us on the PTR. When you open your legacy window for the first time, you’ll get to start building your family tree. That means right now is the time to start thinking about how you plan to populate it. Whom will be your family matriarch/patriarch? As you drag each character into the family tree, over the matriarch/patriarch, you will have the opportunity to decide where they fit in. And don’t stress — you can move them around if you don’t get it quite right on first click-and-drag. The biggest addition here is the Unify Colors button. You may toggle on or off which visible clothing pieces you would like to have color coordinated to match your chestpiece. That means no more putting off equipping that new piece of gear because you don’t want to look like a clown college’s wardrobe mistress. AS you can see, my flitting around from character to character, on different servers, means I haven’t unlocked too many of the available legacy unlocks. But as seen at the top of the post, I did unlock the all important Companion Dance. Other easily attainable unlocks are the Tech Emotes, which allow you to /datapad, /holocom, and /map whenever the feeling suits you. The Crafting changes we’re seeing on the PTR are going to make those crafters among us very happy, starting with the individual profession windows. You can now sort by custom. That means no more clicking on every blue recipe in your window to try to find your moddable gear! And, those custom pieces now show as orange, which gives a visual queue and makes so much more sense. 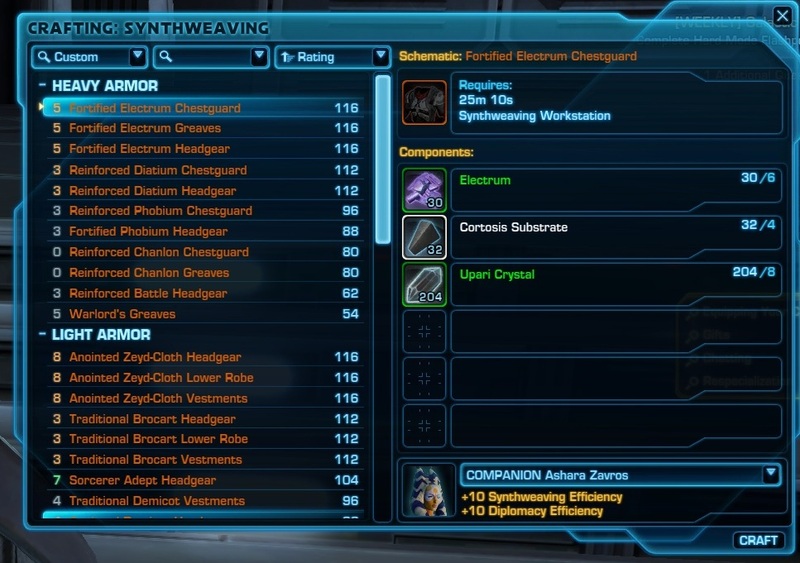 To check out the critical success of moddable pieces, I crafted 25 synthweaving items, across all 3 armor proficiencies. Of those, 5 pieces critted, resulted in an augment slot being added. For ease of ID’ing these exceptional pieces, their names have [augmented] following their name. 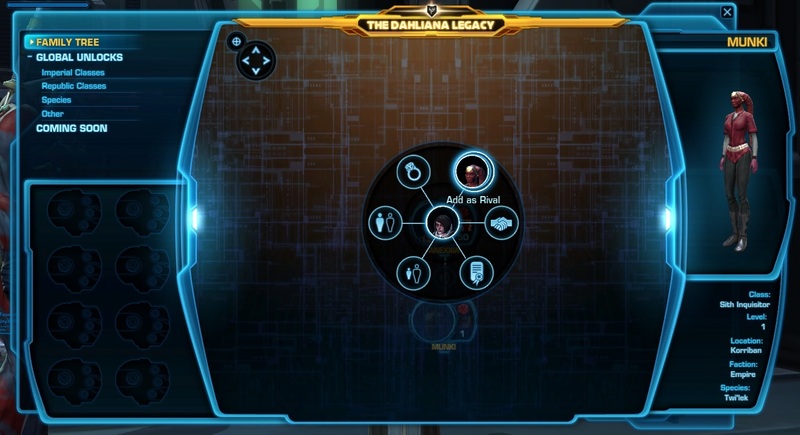 Last and definitely not least, players will now be able to significantly customize their user interface, using in-game functionality. To say that I’m impressed with the level of customization is an understatement. but don’t just take my word for it– take a look at this UI overview window. I consider it to be required viewing for showing you how to make the most of the UI customization options available to you in Patch 1.2. It’s good to have you back! But I am sure it was lovely; I used to live in the Peoples Republic of Marin. 1) Do you plan to buy the BMGTN for your ship? It is a bit pricey. I would have originally been all over that but now that you can just mail items to cross-faction bank alts, BMGTN seems much less useful. I always left alts passing through there in NS to check the GTN but it has died down a lot. 2) Do you see 1.2 as like WoW’s Glyphmas? There will be a huge demand for crafting when 1.2 hits. But once all the 50 raiders/PvPers, the ones who care about gear, get their oranges crafting will just be making gear for new 50s and leveling alts? Or will 1.2 invigorate alts and provide crafting demand after the 1.2 landrush? 3) Without giving away your dark Sith Crafting Secrets (purple lightning hurts! ), you seem to be a lot more about “good looking” 50 orange items as opposed to low level oranges to wear 11-49 or the offsets like wrists, gloves, waist, etc. Is that your plan for 1.2? 3) For my lowbies, blue crafted gear has been easier to obtain than the moddable gear (and it feels like it is harder at the lower levels to get enough currency to keep my mods up-to-date.) As for the gloves/waist/wrists, to date, despite my many characters, I’ve only come across 1 moddable belt that I sold (wrong proficiency for me) and 1 pair of gloves that anexxia is wearing, and no bracers. I personally love that moddable gear allows you to hold on to gear pieces you love, and never outlevel them. I have not spent time trying to further upgrade the epic pieces I can make due to it feeling like it is too much of an investment versus ROI gap. Most of my servers are pretty conservative in their GTN prices. alts. In particular, iirc cybertech armor are every two levels, but modes and enhancements are every four so you can use the previous alt’s commendations to fill in the gap. They are BoE so you could try to turn them into the “valor bracers”. Although personally no gear is worth having to deal with trade chat. I am confused why, in addition to level 27 orange boots, Davorak sells orange level 9 heavy armor gloves – nothing for med or light. My google spreadsheet is woefully un filled out. 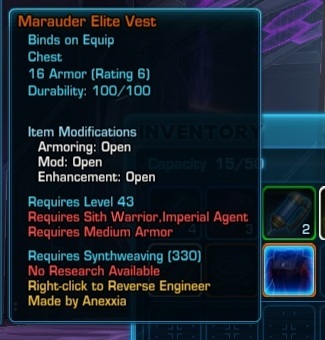 The moldable gear sold for commendations is easy since an alt in the space station can go around and see any planet vendors. It’s the sell for gold vendors on the planet that were more trouble. Plus remembering the LS/DS vendor and figuring out what can be crafted. And orange gear from crafters is a bit more complicated. 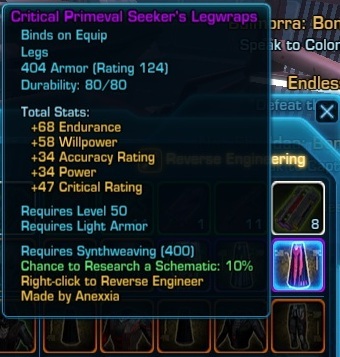 E.g., my sith warrior was wearing orange chest and pants at level 11 which were made by an armor smith not synth weaver. I am surprised I have not seen an article on that with the 1.2 changes. 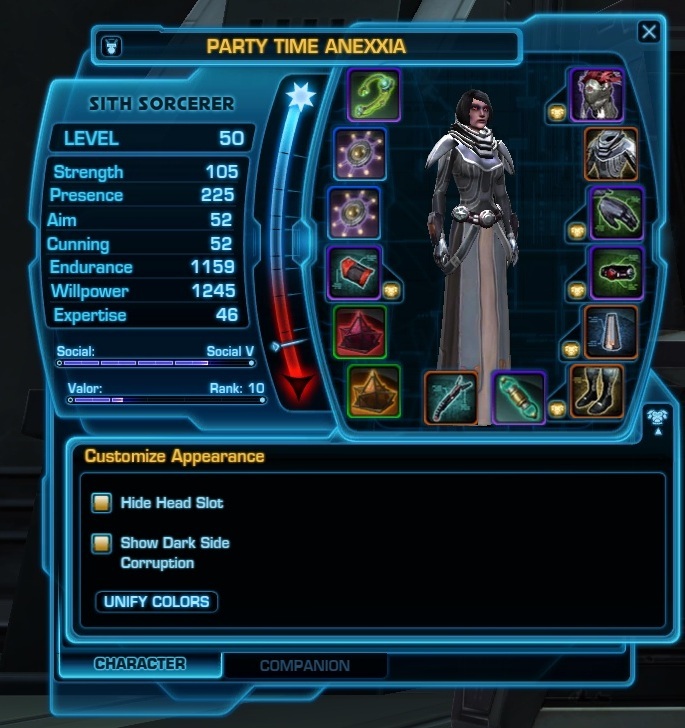 If you need separate PvP and PvE gear sets anyway, why not put your Sith Warriors’ PvP set as a BH look-and-feel in order to distract the WZ opponents. Perhaps there is a bit of initial confusion – e.g. the opponent is surprised when the BH running towards them Force Leaps into a hut ball score. Being able to spam Force Lightening saves the cast time of LS and means purple lightening is almost always flowing from your hands – A Good Thing. @Hagu I am definitely trying out Madness on my new baby Inquisitor. Talking with All Classes Considered on Galactic Public Radio last week definitely sold me on it!